There are some questions to ask when buying a mattress. They are not necessarily connected with the mattress itself, though some can be. Sure, if you have back pain or you are particularly light or heavy in weight you want to be sure the mattress you purchase is suitable for you. Young couples might want to know if it is bouncy, and the elderly may ask about resistance to fluids and 'spillages.' If you get hay fever you may ask if the mattress is hypoallergenic or how to prevent an accumulation of dust mites. Different people will have different questions to ask, but what are the questions you should ask. What are the questions that are unrelated to the properties of your mattress? Questions that have little to do with its bounciness, hardness, softness or even whether or not it's made from memory foam, Dunlop or Talalay latex or any other question regarding the physical form and properties of the mattress? 1. What's the Level of Motion Separation? Motion separation, also referred to as motion isolation, refers to the way the movement of one partner in a bed upsets the sleep of another. If this is important to you then you should ask the question. "How does this mattress separate the motion of my partner when he or she moves about in the night?" This can be very important to someone whose partner tends to toss and turn during the night. Some mattresses are better in this respect than others. 2. Does the Mattress Help Keep Me Cool at Night? Many people can get hot during the night, particularly in the hot summer months. They need a mattress that helps to wick away the heat and help keep them cool. It's a reasonable question to ask. Some do and some don't. Gel memory foams can help in this respect. The gel absorbs heat as you go to sleep, enabling you to sleep quicker because you are not heating up. However, it doesn't last all night and you may feel hot when you wake in the morning – in which case just get up! If this is a problem for you, then look for a mattress where the gel layer is right at the top, and separating you from the main foam layer of the mattress. Some companies use carbon-infused foams, or even copper or titanium to absorb and conduct the heat away from your body. If you tend to sleep too hot, then look for a cooling mattress that contains gel, carbon, copper or even titanium – many of these do work! 3. What Type of Mattress Foundation Will I Need? One very important question is whether or not the mattress needs a foundation, and if so, what type. You will usually find that an innerspring mattress is recommended to be laid on a box spring foundation to even out the wear on the springs. A foam mattress will likely not need a foundation, although it would help to keep the mattress higher up off the floor. Many people find that when their mattress is too near the floor, they find it difficult to get out and stand up in the morning, particularly the elderly. 4. Is the Mattress Non-Toxic? 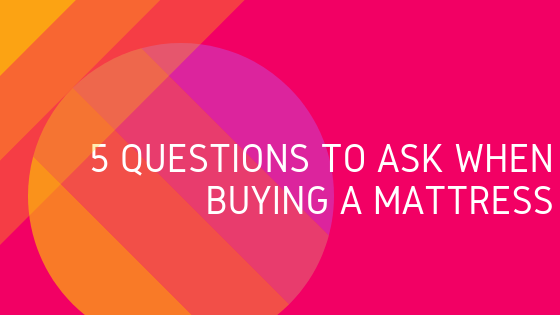 This can be one of the most important questions to ask when buying a mattress. Particularly so if you tend to get allergies, are particularly sensitive to certain types of chemicals, or you have children in the house. Ask if your mattress is Certi-PUR certified. This signifies that your mattress does not contain foams that breach the Certi-PUR standards. In the US this is referred to as CertiPUR-US, but the standard is the same worldwide. Mattress Sleep Trial: If a mattress manufacturer is confident of the quality of its products, then it may offer a sleep trial. That may be for 30, 100 or in some cases even 200 nights. The sleep trial enables you to test the mattress for the stated period. If you don't like it, then return it. You will generally have to pay the return transport cost - and in some cases also a restocking cost. The restocking cost relates to the work needed to make the mattress look new again and returned to the vendor's stock. Mattress Warranty: The warranty covers you for any manufacturing defects or poor workmanship. You must read your warranty conditions carefully, not just for its expiry period. Many warranties apply only under certain conditions: for example, indentations in the mattress of a specified depth, no evidence of pets using the mattress and no obvious evidence of misuse. These are likely five of the most important questions to ask when buying a mattress. They are generally the questions you will ask once you have a good idea of the mattress you want. They are all important questions, even if they have little to do with the design or make of the mattress you choose. Keep them in mind when you begin your mattress shopping, and never part with any money until you are satisfied with the answers given. Weddings are considered to be the happiest occasions of life. 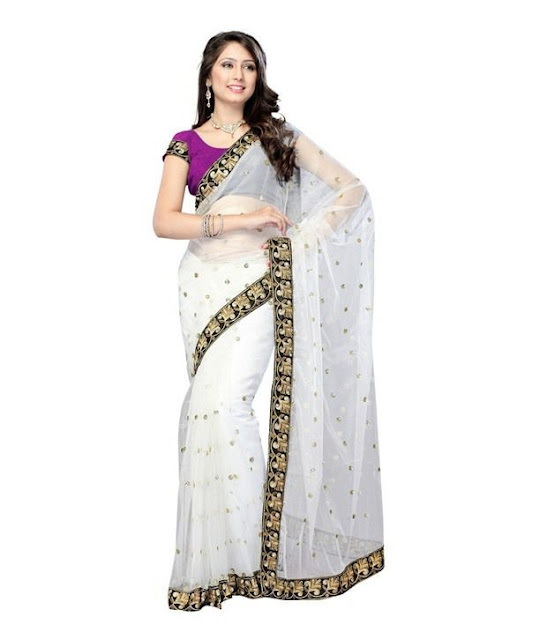 We understand how much important this is for the woman to flaunt sarees on each occasion. No matter whether it’s the color combination, the print, and the border patterns, Sarees have the special place in a woman’s wardrobe. The most beautiful outfits, jewelry, and other accessories get reserved for the grand Indian wedding events. Everyone gets decked up, all set to bag the compliments at the wedding. Women, men, children, elderly people, youngsters, everyone look their best. However, one most enticing element in the wedding is saree. It forms an essential part of a bridal wardrobe also. Although this attire has been worn since ages, still it maintains its charm and grace. Nothing enhances the attractiveness of an Indian woman as sari does. Furthermore, today the fashion experts are working on this attire to make it the style and fashion statement. There are several brands accessible at StyleCaret that gives a diverse range of the beautiful sarees that can be worn at the wedding. 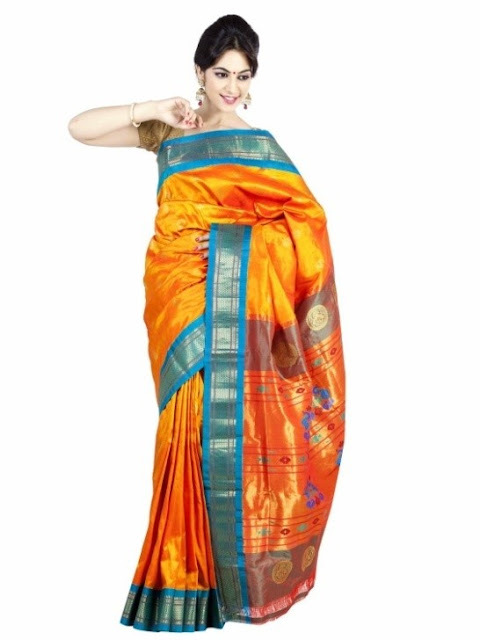 There are traditional sarees and minimalistic sarees and both of them are quite popular among women, old and young. At Style Caret, we offer you an enormous range of the wedding sarees in different designs, color, material and motifs to select from. Here is the list of different kinds of sarees the each bride or woman attending the wedding, must have in the collection. South India has much more than the delicious food, serene nature and rich culture. The Kanjeevaram saree is the magnificent bridal attire. The embroidery and artwork are very rich and upholds cultural art, and serve as the canvas to display the skill of native makers. Wearing a Kanjeevaram saree at the wedding is one best choice because it flawlessly defines the royalty. These types of sarees are highly popular and favorite bridal sarees. They’re not just famous in India but also in the whole world. The extraordinary adornment of style and designs running on the silk cloth will define the absolute richness and nobility. The Banarasi saree is a splendid option for the bride. Most of the Bengali brides even today go for the Banarasi Saree. One of the most wonderful sarees in the entire world is ones that will radiate simplicity. 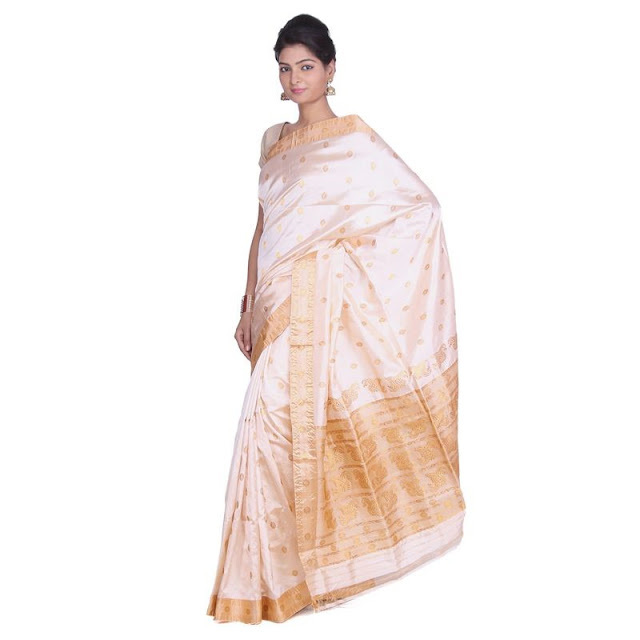 The Assamese sarees are a proof that the simplicity is an ultimate sophistication. The sarees are gracefully designed with the best of Assam silk with the unique and amazing choice. Assam sarees are mainly white silk with the red embroidered borders all along the end; it is a definition of elegance. The modern and minimalist perspective is essential to elevate the tradition. With an ever-changing fashion trends, the net saree has seen plenty of change in the use. Considered as the poor choice, net isn’t used in increasing sophistication of the gorgeous and the traditional bridal dress. This type of saree is preferred by North Indian women. These sarees thrive while it comes about experimenting. There is no limit to the design and alterations while it comes about Odissi sarees. You will find a vast range and different kinds of the sophisticated embroidery, sarees for everyday life, comfortable sarees; everything gets covered by Odissi tradition. There are silk and cotton fabrics that look totally gorgeous on sarees. Some Odissi saree types include Katki and Bomkai. But the type of saree that stands out is Sambalpuri Silk. Sarees aren’t just flaunted for their brocade and designs. 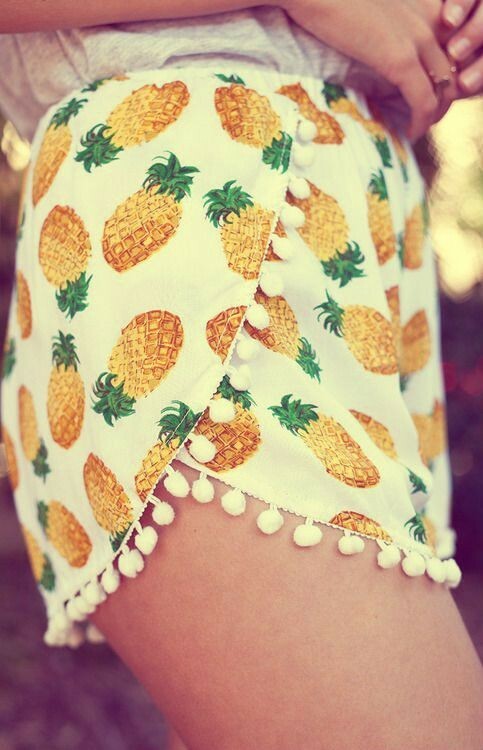 They are adorned best with value and gold. Paithani sarees have got gold thread work that makes them the highly expensive sarees of the world. The saree wore by the princesses and queens during old times have managed to get preserved through age of history and time. These types of sarees are a true example of the absolute royalty. 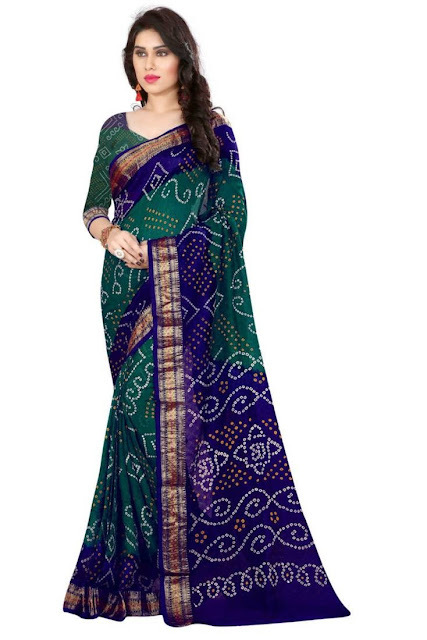 These types of the sarees are mainly preferred in Maharashtra. Paithani silk gets imported from Aurangabad, and protecting the time and history through fashion and art. This type of saree always looks very classy and comfortable. 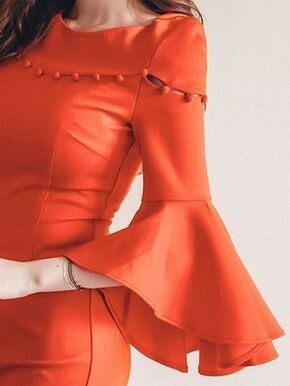 Obviously, it is elegant and looks out of the box in the crowd and known for its uniqueness in the wedding. Nothing will accentuate the Indian curves like Pattu saree. Originated from Kerala, these sarees are the work of the simplistic design, mainly preferred by the South Indian brides. Bandhani sarees are the stylish fashion statement. These polka designs of sarees reveal the wide variety of the color combinations that make these sarees the absolute head turner. Bandhej or Bandhani sarees are highly preferred attire at the Rajasthani and Gujarati weddings. These are the highly beautiful sarees designed in the old Indian style. The most famous wedding saree design is Zardosi saree. They are minimalistic but not much. They’re traditional in nature and also very comfortable and simple to carry. It is used in silk and netted sarees. So, these are some different kinds of sarees that are ideal for Indian wedding scenario. Whether it is the bride, or best friend, young adult, or grandmother, one or more of these styles of sarees will definitely intrigue you. 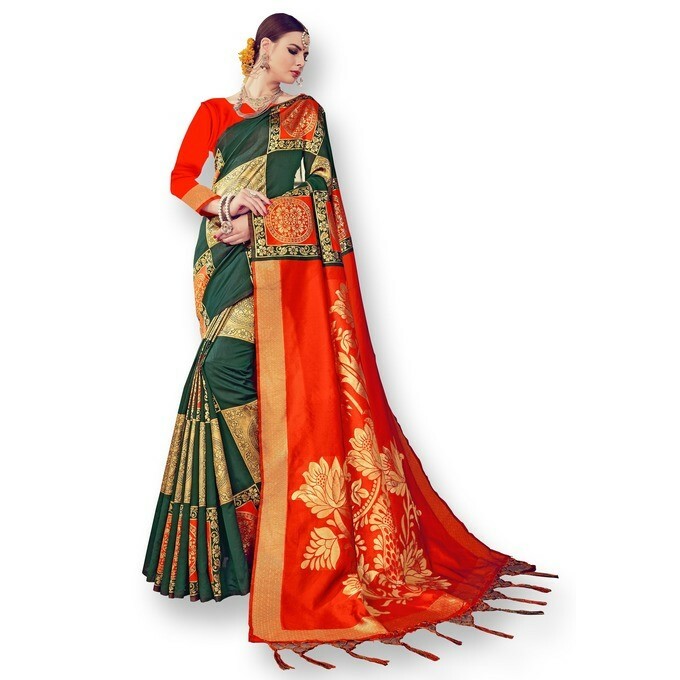 Shopping for the wedding saree is one most attractive thing for the prospective bride. From ages, friends and parents are shopping for the eloquent and beautiful set of the sarees for bride. Shopping for the bridal sarees is totally incomplete unless you do not get to choose the traditional colors in pink, auspicious red saree and turmeric yellow. At Stylecaret, you will find the right harmony of fashion, style, and appeal. Pick from the collection of sarees that feature Bemberg, Silk, Chanderi, Chiffon, Crepe, Bandhej, Satin, Georgette, and Shimmer. The mix of the latest fashion and tradition is tough to assemble. Designed to suit your culture, we provide you the bridal saris, which are ideal for the brides from every community and region. 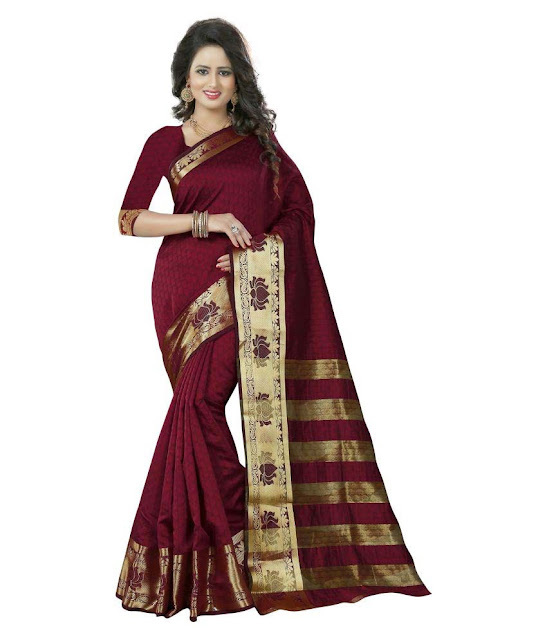 Just don’t forget to take a close look at the most favorite Maroon Wedding Saree deigned from the Faux Chiffon. Embroidery, Cut Dana & delicate blue border curving from the shoulder make it the classy choice for the wedding. Another popular saree that is quite famous with the brides is the Golden Wedding Saree made in Georgette with compelling stone and Moti work on it. 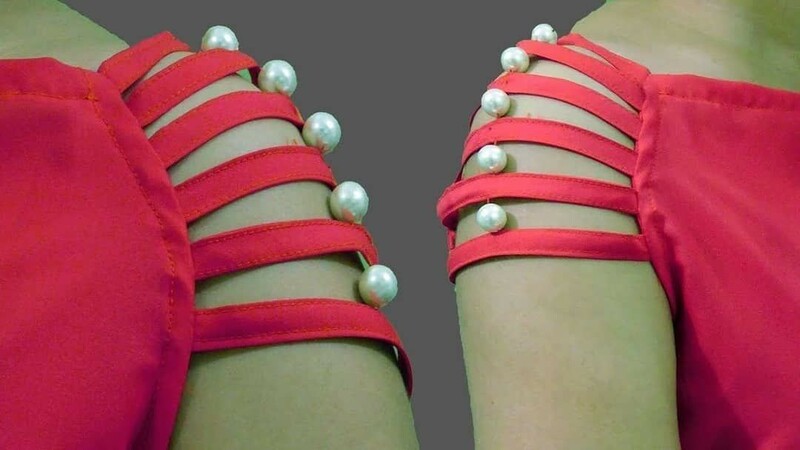 This makes any bride look like a princess on her wedding day. Wedding is one lavish affair, and for this reason, we bring some classy range of bridal sarees at the prices that you will fall in love spending at. You can check out the exclusive bridal saree from the top wedding saree online store and buy the stylish and modern bridal sari and accessories for your biggest day of life at the unbelievable price range. Kurtis are an epitome of casual comfort but when you want to flaunt it for a special occasion you need something more stylish and trendy. 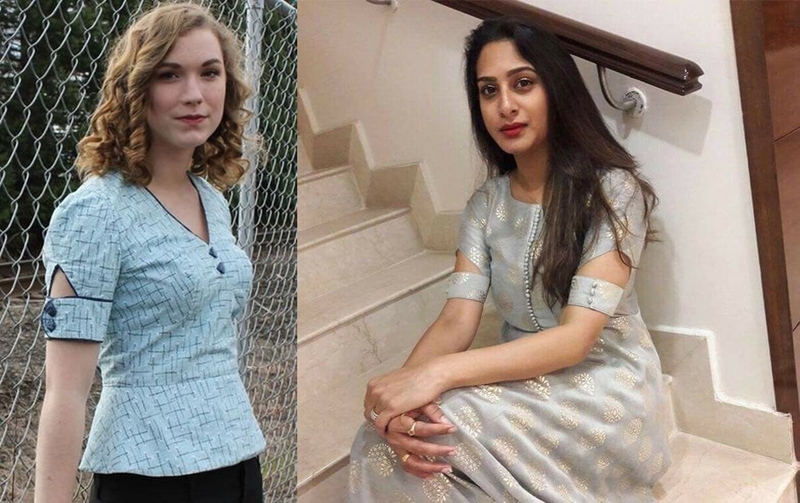 A kurti with a unique neckline or offbeat hemline is sure to help you grab attention but what is actually really in these days is fashionable sleeve patterns. 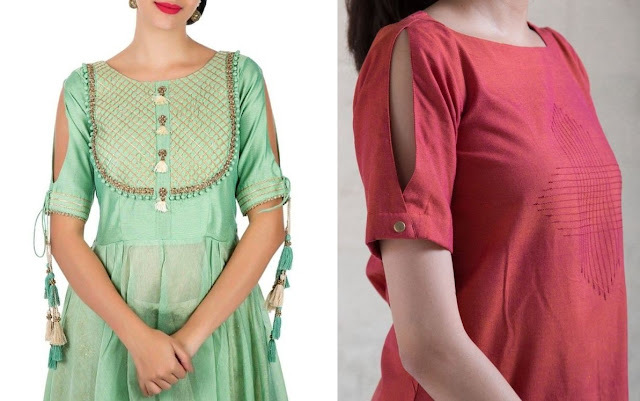 From bell sleeves to cold shoulders, chic sleeve designs for kurti increases the oomph factor of your outfit. 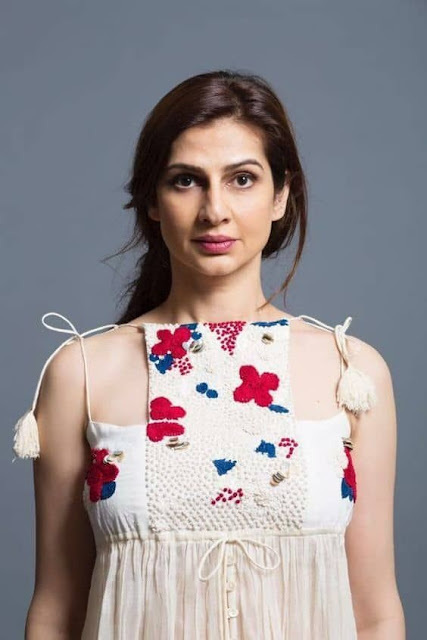 If you are getting a kurti stitched for a festive event and cant decide on how to make it look striking and then it is best to keep the neckline basic and experiment with latest sleeve styles. 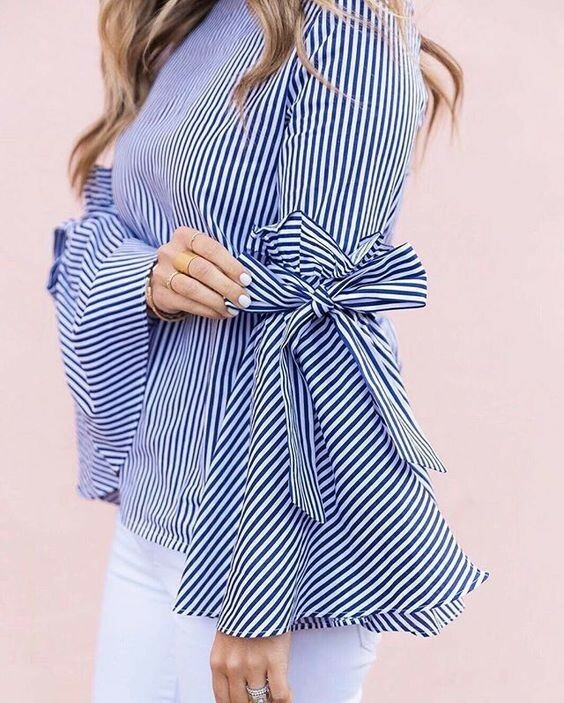 Keeping the neckline simple means you are allowed to flaunt neck jewelry and your trendy sleeves can also complement to make a statement of their own. Here in this post I have curated a list of some of the latest and most popular sleeves design for kurti which you can try in 2019 for an up to date charming look. These sleeves design for kurti can also be tried with your salwar suits for a glam traditional look. 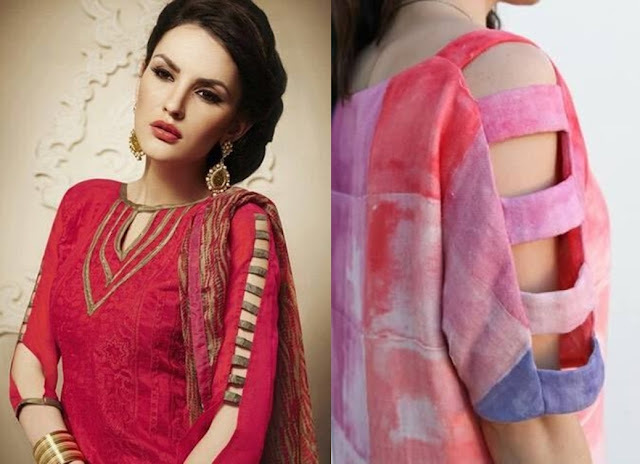 If you like experimenting with your saree blouse designs then try some of these sleeve variations even on them for a striking designer blouse pattern. 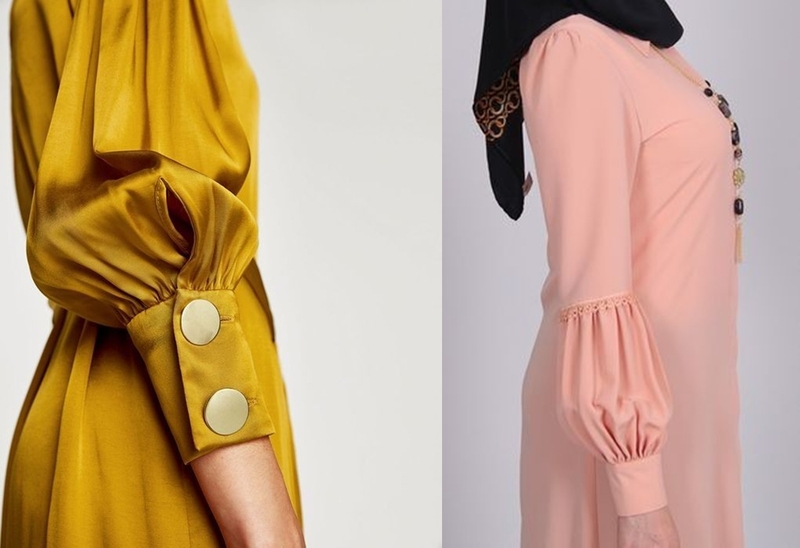 Frill sleeves have a retro charm to them but have come back with a huge bang this season. 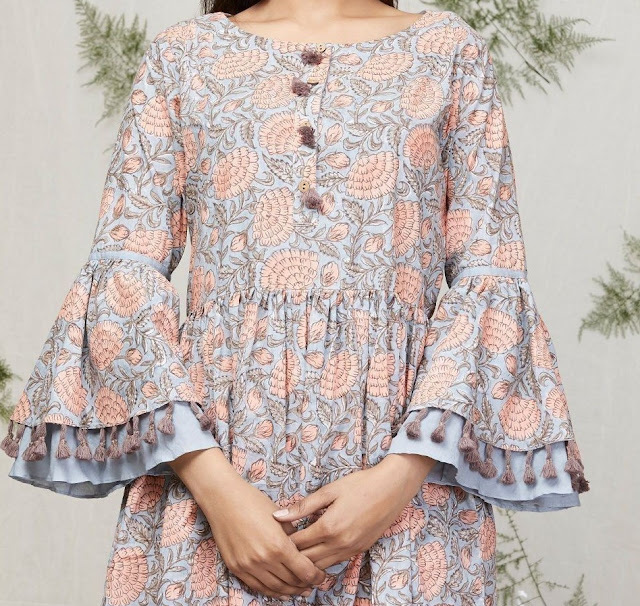 I totally love the idea of kurtis with frill sleeve details but extravagant flare details tend to get a bit of difficult to manage with everyday kurtis. So, I suggest you try these alluring sleeve styles with festive kurtis. 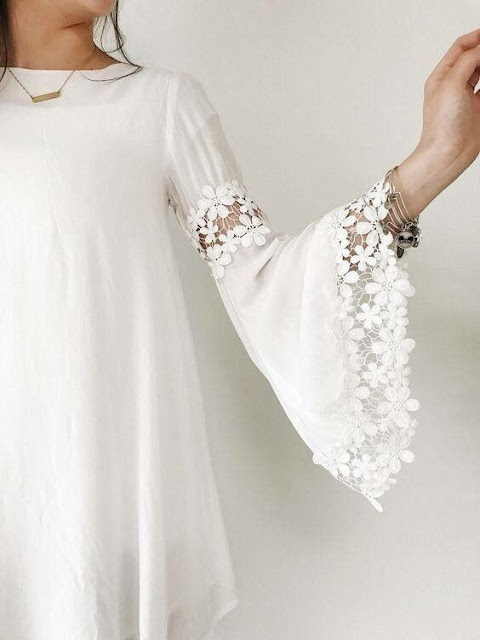 Get these sleeves embellished or embroidered to increase their visual appeal. you can also add tassel details to sleeve hem for a chic vibe. 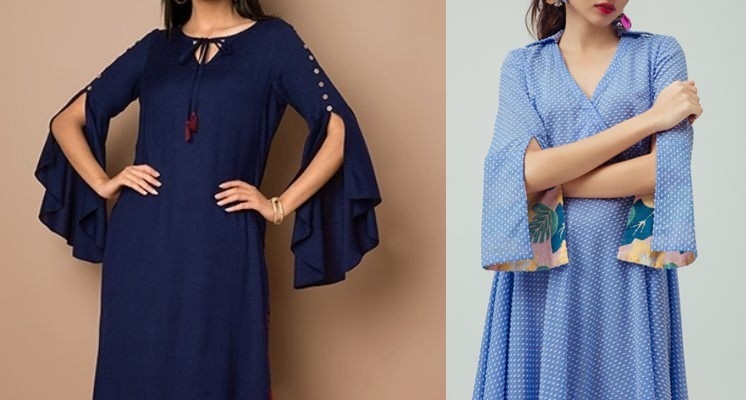 If you want to try this kind of sleeves with everyday wear kurtis then go for frill details in relatively less flare, for added impact you can get the frill in contrasting colour to stand out. 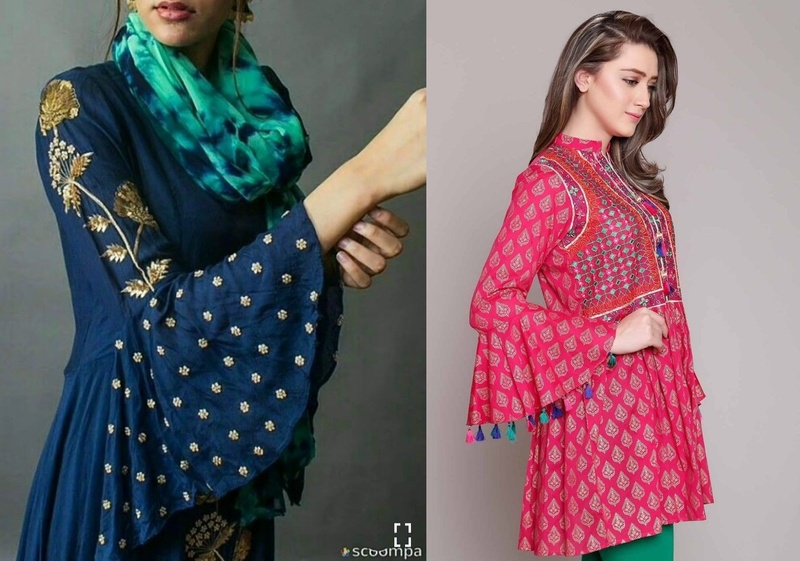 Cold shoulder sleeves design for kurti is ofcourse a trend which is couple of seasons old but it refuses to fade away anytime soon making it a hot sleeve pattern to try in 2019 too. If you are going for plain kurtis then cold shoulders is an interesting way to add a bit of drama. This sleeve style works well even with printed or brocade kurtis. With embellished or embroidered kurtis you may want to avoid this sleeve design. This latest sleeves design for kurtis is chic, contemporary and fun. 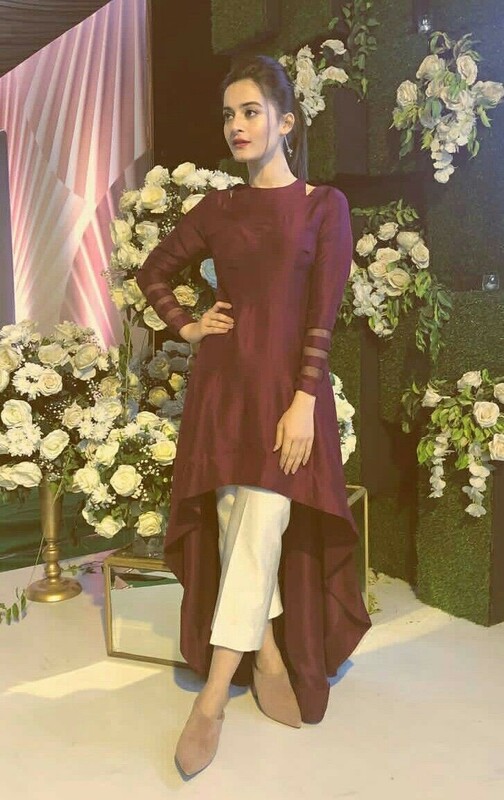 Slit sleeve patterns were actually very popular for years but this design uses the slit detail as a stand out element by going for a longer than normal slit which looks uber stylish. A three quarter length cut sleeves with a slit detail till your elbows is the way to go. For more glam appeal you can go for slit detail on flared sleeves or add a edgy printed lining to your sleeves. For casual kurtis go for a playful bow detailing on the sleeve hemline. 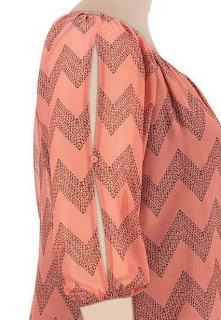 This bow detail gives a very modern appeal to your kurtis and is an effortless way to make a statement. The bow detail can be made from fabric matching your kurti or you an choose to contrast it too. Elbow length flare sleeves are hot in trend these days but if you want to take things notches up add a lace panel. 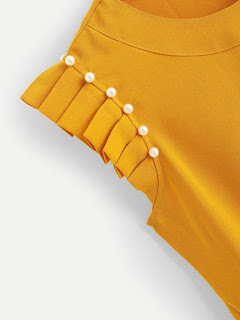 An element of embellished sheer in necklines are pretty popular and they will work equally well in sleeves too. 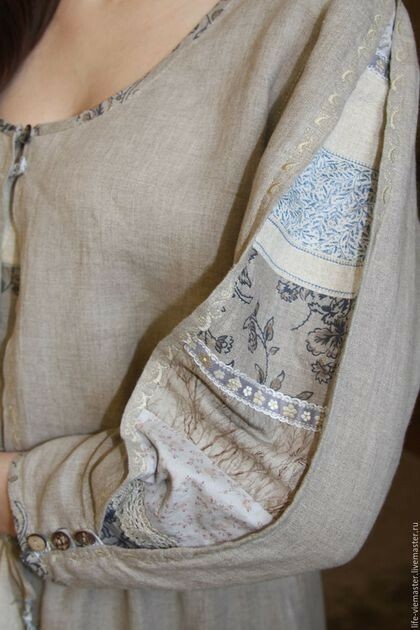 This eye catching sleeve pattern works best with solid coloured kurtas for a chic semi formal look. 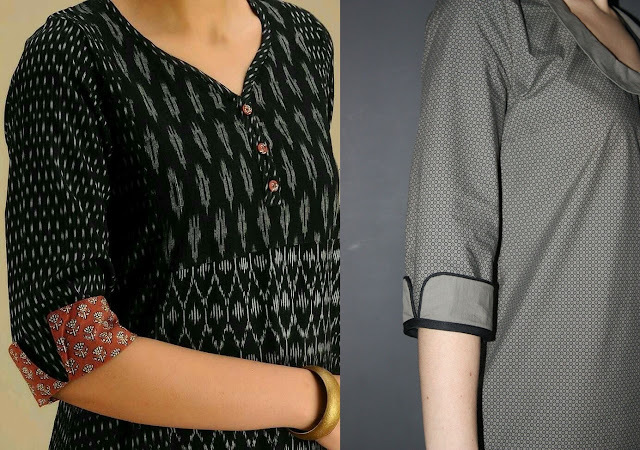 Want a vintage charm with your formal kurtis then go for a shirt inspired pleated long sleeve pattern. Keep the sleeves plain for formal kurtis or add some over sized buttons for semi formal appeal. 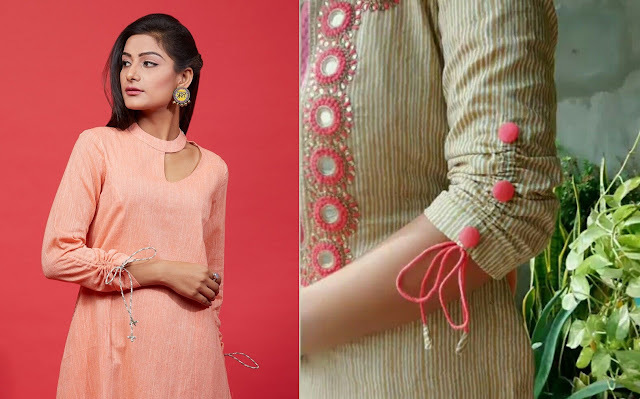 Another simple yet stylish sleeves design for kurti to try is three quarter length sleeves with a small slit detail brought together with trendy tassel tie ups. If you are a fan of tie ups like me then this is a gorgeous way to add tie ups to sleeve and the best part is this design works for all kinds of kurtis. It can be casual, formal, semi formal or even festive kurtas, this sleeve pattern is sure to blend in and look fancy. If tie ups isnt your thing then with the same three quarter length slit sleeves you can opt for stylish buttons. 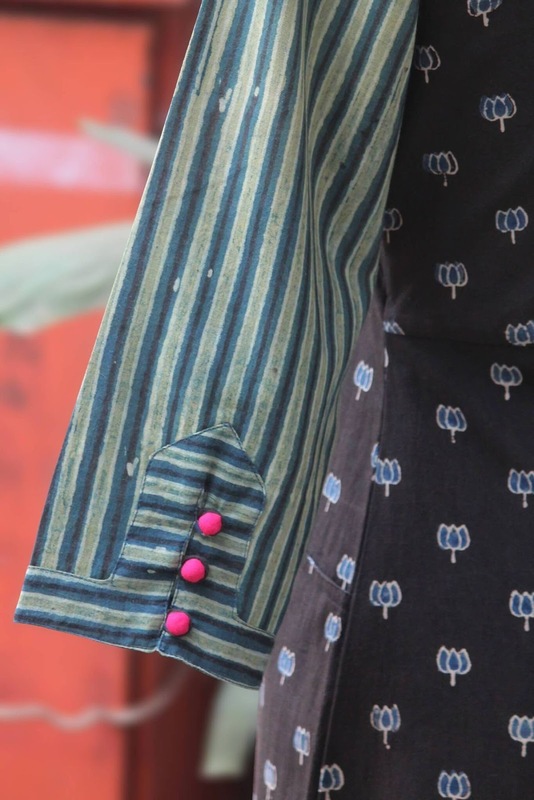 Personally I think buttons make a more practical option with everyday kurtas and you can reserve the tie up details for special occasion kurtas. 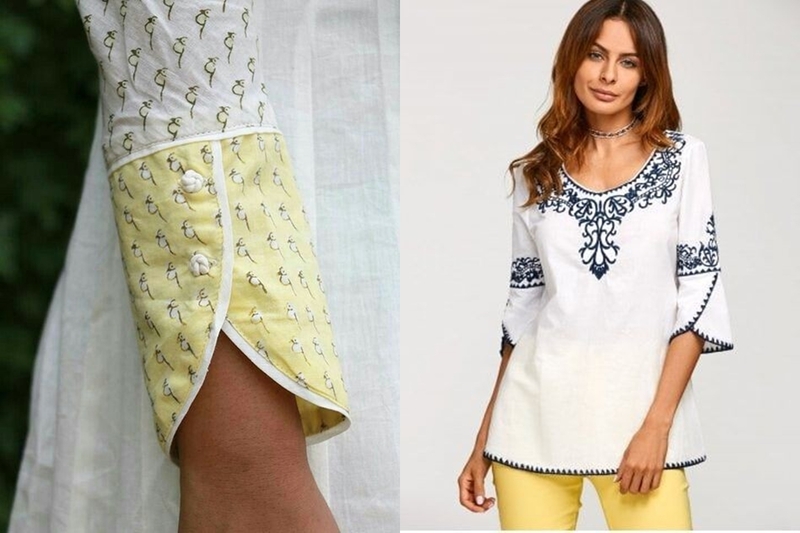 Slit sleeves can look pretty overwhelming for everyday wear or even formal wear so you opt for a more modest faux slit sleeves design for kurti. This sleeve style is most suited for short flared kurtis to give a indo western feel which can be worn both casual or formal way. If sleeveless is what works for you then get trendy even with this sleeve pattern. Opt for this gorgeous fusion tie up sleeves design for kurti which has a straight arm hole cut out instead of the normal round ones. These kind of sleeve pattern works well with embroidered tie up neck on special occasion kurtis. For added impact pair a kurti like this with jeans. 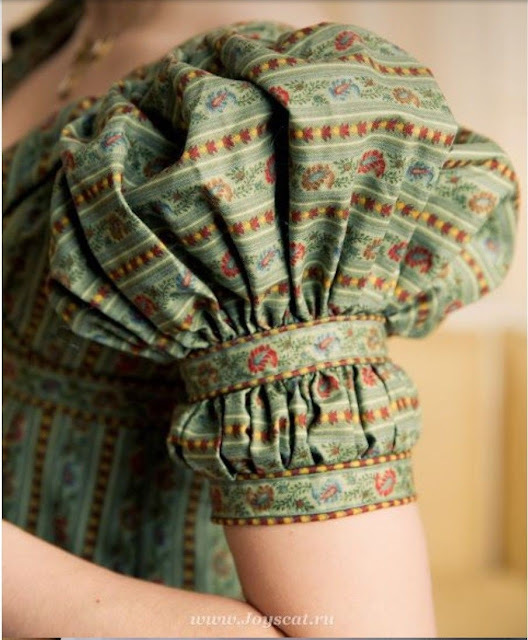 This sleeve style which has a slight overlap detail and frill edge trim works best for western dress patterns. Indian wear these days is getting so contemporary, allowing you to try this pattern with your kurtas too. 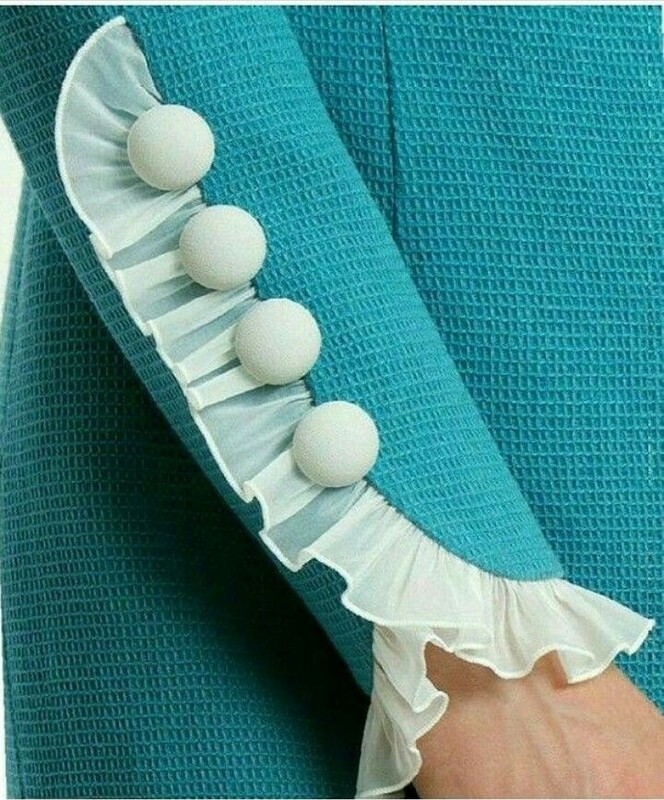 Combined with a row of luxe buttons this sleeve is sure to stand out and how! 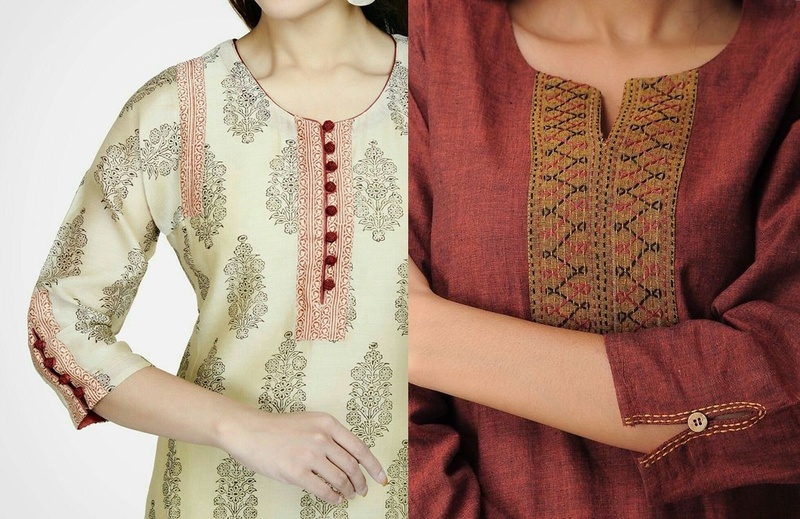 Festive kurtas demand something catchy, something extra. 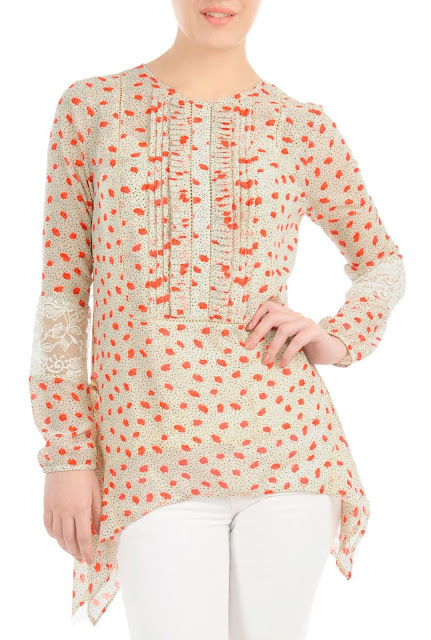 This layered lace frill sleeves design for kurti will help you stay ahead of the ethnic wear trend game. A sure shot stunner especially when paired with floral prints. 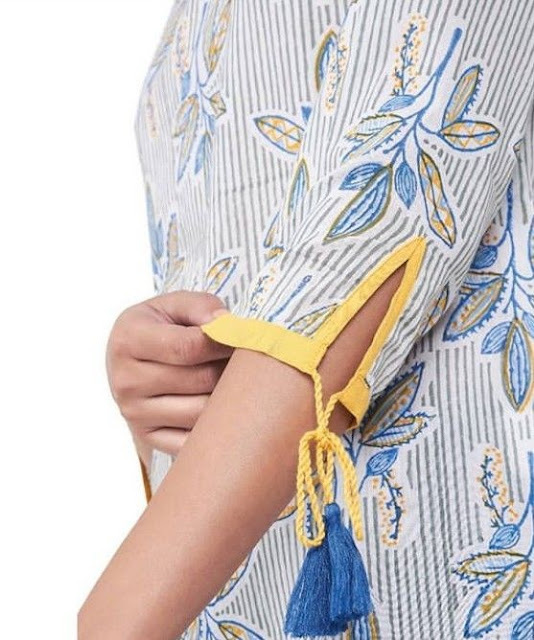 A classic sleeve of sorts this criss cross dori design is actually pretty old trend but it works well even in 2019 if revived in traditional cut kurtis with contrasting colours. 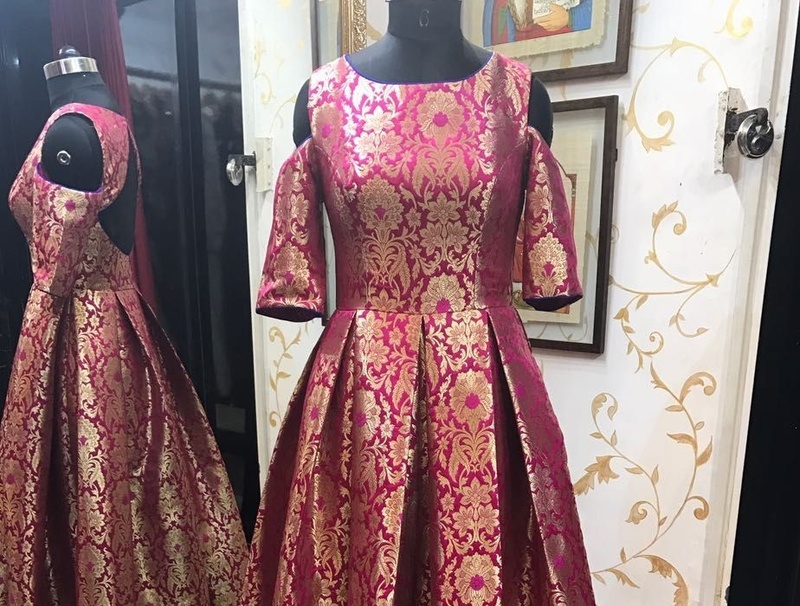 This design actually is more popular with salwar suit sleeves but no harm in trying with kurtis for a look which spell elegance. 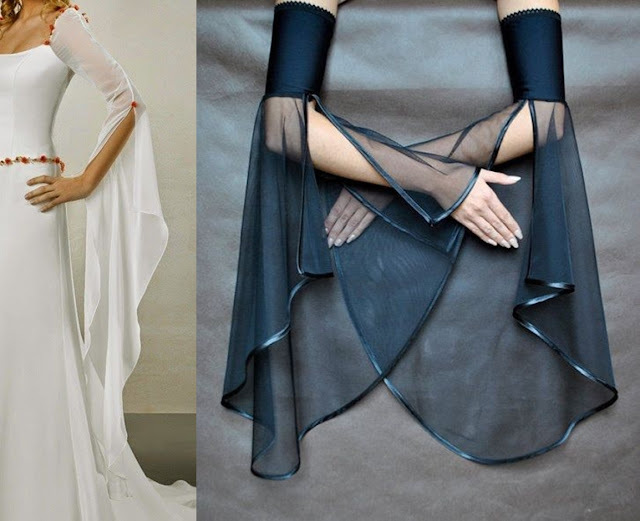 More suited for gowns, tops and dresses, this flared sleeves with lace panels gives a very graceful and chic look. If your kurti pattern is more feminine and flirty with asymmetric hemline and flowy fabric this kind of sleeve can be a perfect match. A sure shot head turner is this full length sheer sleeves design for kurti with balloon flare. 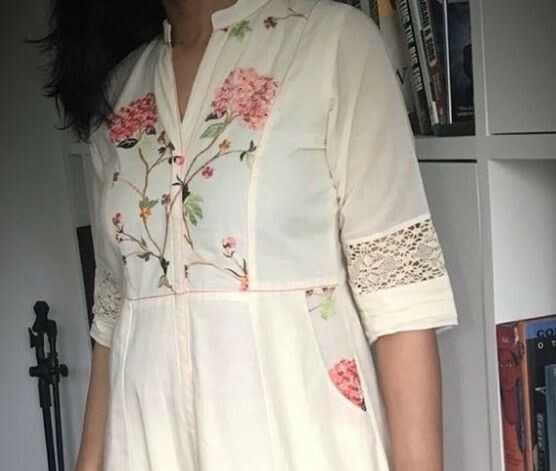 Add sequined embroidery details to sheer sleeves and keep rest of your kurti simple and styling minimal for sleeves like this to make a statement of their own. This sleeves design works best for festive anarkali kurtis. Puff sleeves are an instant hit with saree blouse designs but they are rarely seen in kurti sleeves. Time to switch things up and go for a dramatic puff sleeves design for kurti in 2019 for mind blowing look. Conventional kurtis paired with the seasons hottest trend cold shoulders make for a glam combination but I suggest you go a step further and a cold shoulder to frill sleeves. This one is a must try with short kurtis or printed A-line kurtas. 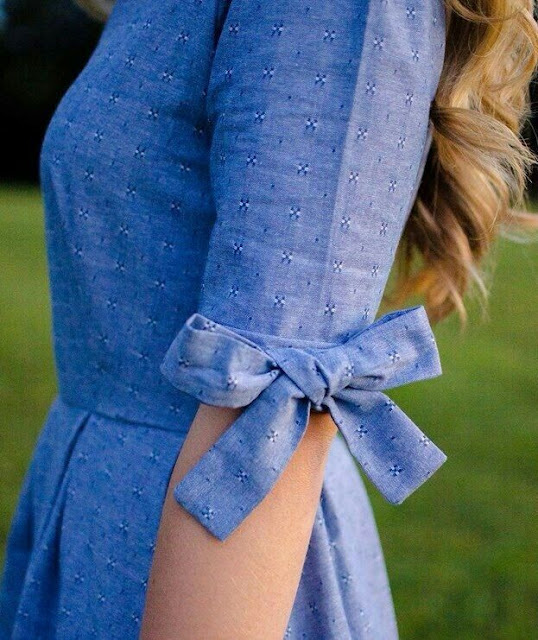 A very fashionable spin to the three quarter sleeve pattern is this one with strings tie up. I love how this looks stylish and elegant without putting much effort. Which of these latest sleeve designs are you looking to try in 2019?